To understand the context, for the past many mornings on the way to her school, we've passed a flock of hummingbirds zipping in and out among the flowers. I love these walks with my daughter because no matter how chaotic the "get-the-kids-to-school" morning rush has been, by the time we reach the hummingbirds she's happy. This picture captures beautifully the essence of our walks. 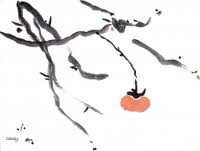 I particularly liked this drawing because I've always been fascinated by Japanese "sumi-e" inkbrush painting. 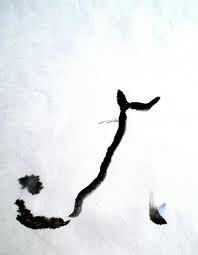 Sumi-e is a style of art that seeks to capture the essence of a scene with the minimum number of brushstroke. And what I find fascinating is how the essence is often conveyed less by the actual strokes you see as by the strokes that were never made. 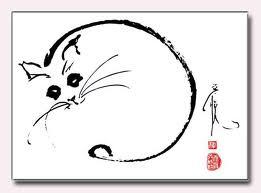 In marketing, when developing positioning or crafting a message, we face the same challenge as the sumi-e artist, namely how to communicate the essence of our message with the fewest possible elements. But, this is harder to do than it looks. When faced with the task of developing a slogan, positioning statement, or the ubiquitous elevator pitch, we often take the direct approach which is to describe it in more detail. The problem with this is that in our zeal to describe things completely, we lose the essence in the complexity. Whether we're creating a marketing message, a position statement, a strategy, a product, we only learn what's the core essence by continually removing the extraneous and by imposing restrictions. This is one of the keys behind the concept of Minimum Viable Product in Customer Development. This is the purpose of the "60/60" rule (i.e. 60 seconds or less in 60 words or less) in elevator pitch development. This is why any business strategy that requires more than a single page to describe becomes dead paper. When know too far? Not connecting. On October 13, 2010 I had the opportunity to listen to Mark Suster (Both Sides of the Table blog) present at the Stanford Entrepreneurial Thought Leaders series. I like Mark's blog because having been an entrepreneur and a VC, he brings both the inside and outside view to the startup world. The purpose of his talk was to "joust with some dragons" the dragons being Silicon Valley conventional wisdom. He then proceeded to take jabs at the Lean Startup movement ("lean does not mean fast, fast means fast, rapid means fast..."), super angels, and most of all the notion of "fail fast." Now before you get out the pitch forks, heat up the tar and feathers, and conjure up a flash mob in Los Angeles, it's important to understand the context of the statement. He was not saying that people in Silicon Valley don't work hard or long hours in general. He was saying this in the context of doing market research, i.e. doing the homework. Unfortunately, market research has become an almost scatological term in Silicon Valley signifying "analysis paralysis", spreadsheet slight of hand, and navel gazing. Instead, "launch and learn" usually shouted from beneath the banner of Customer Development, has become the new rallying cry as the substitute for market research. And for many entrepreneurs with borderline ADHD and strong bias towards action, it feels so much better. Hypotheses 2, 3, 5, and 6 fit squarely into the definition of market research. In fact, what many people lose sight of is that Customer Development is a market research methodology. Getting out of the building and A/B split testing are just the tools used to validate hypotheses to be added to other tools in the kit like customer surveys and conjoint analysis, each with its strengths and weaknesses. Suster's point was that for some in Silicon Valley, "launch and learn" has become an excuse for laziness, for not doing the hard, sometimes boring, grunt work of market research. Who are the players? When and how did they get started? What's been tried before? How did the channels evolve, etc.? But "launch and learn" does not eliminate the need to do market research, to know the industry, to do the homework. Which led him to make another interesting statement that as a VC, "I'll pass if someone doesn't know the history of their industry." Thanks Mark, for a thought provoking presentation. This Monday, October 11th, we celebrate the only U.S. holiday that honors an entrepreneur: Columbus Day. Christopher Columbus is best known as the explorer who discovered the Americas*, but he was first and foremost an entrepreneur. His journey was not one of pure exploration, but driven by commercial advantage. And his story shows that the entrepreneur's journey remains the same 500 years later. During the reign of the Mongol Empire, trade between Europe and the Orient, via the Silk Road, was a fairly safe and lucrative one. That all changed in 1453 with the fall of Constantinople to the Ottoman Turks. Trade routes collapsed leading to a scramble for alternatives. There were two main options: an eastern route around Africa or a hypothesized western route across the Atlantic. Contrary to popular belief, educated Europeans did not believe the world was flat. In fact, recent advances in celestial navigation rested on the fact that the Earth was spherical. But for a variety of reasons, there were different estimates for the circumference of the Earth. To make a long story short, Columbus estimated the westward distance from the Canary Islands to Japan to be ~3700 km (the correct figure is 19,600 km). Even so, a sea voyage of even that length was pushing the limits of the maritime technology of the day. While the easterly trade winds might enable a voyage of that distance westward, the question was how to return. 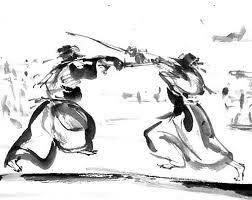 Fighting those same winds eastward would likely exhaust the provisions that ships of that day could carry. Therefore the western route was considered unfeasible. But Columbus had a plan. Based on his 25 years as an ocean trader and his knowledge of the trade winds, he proposed to use the westerlies further north in the mid-Atlantic, to make the return trip feasible. In 1488, Bartholomeu Dias of Portugal rounded the Cape of Good Hope which eventually resulted in Portugal's establishment and control of an eastern sea route along the coast of Africa, India, and ultimately to China and Japan. Enter Spain. Desparate for funds after a long and expensive war pushing the Moors off the Iberian peninsula, King Ferdinand of Aragon and Queen Isabella of Castile needed a way to boost trade revenues. With Portugal in firm control of the eastern route, they were willing to entertain the more speculative western option. Initially, Columbus took his proposal to King John of Portugal, Genoa, and Venice the "market leaders" in the Orient trade routes. But King John's experts correctly rejected the proposal on the basis that Columbus's distance estimates were too short. His negotiations with Genoa and Venice were unsuccessful. Finally, he sought audience with the Catholic Monarchs of Spain and in 1486 presented his proposal to Queen Isabella. Columbus proposed to discover a western route to the Orient for Spain in one year in exchange for funding for three ships. If successful, he wanted 10% of the revenues from the new lands in perpetuity, an option to buy one-eighth interest in any commercial venture with the new lands and one-eighth of the profits, the rank of Admiral of the Ocean Sea, and appointment as Viceroy and Governor of all new lands discovered. As in the case with King John and for the same reasons, the Queen's experts advised her to reject the proposal. However, to keep Columbus from taking the proposal elsewhere and to maintain an option, Spain paid Columbus a small stipend to support him as he sought to raise funding from private investors. Columbus lined up commitments for half of the funds from private Italian investors provided he could find a lead investor. After two years of negotiations and some tempering of the deal, Spain agreed to fund the venture. Columbus departed Spain on August 3, 1492 with the flagship Santa Maria plus the Nina, and Pinta and as new ventures go, the plan quickly ran into reality. First, Columbus expected the journey to last four weeks. Instead it took five weeks with Columbus narrowly avoiding a mutiny. He made landfall on October 12, 1492 in the Bahamas but convinced he had reached India. Two months later, the Santa Maria ran aground and had to be abandoned. On the return voyage, a storm forced them to make landfall in Portugal instead of Spain where they were detained for a week. They were then allowed to proceed and returned to Spain on March 15, 1493, faster than the one year allotted. Success! Columbus was ennobled and granted the title of Admiral of the Ocean Seas. The Church granted Spain exclusive rights to all lands beyond a line 100 miles west of the Azores, a monopoly that enriched Spain for the next 300 years. On September 24, 1493 Admiral Columbus led the first of three voyages to colonize and explore the "Indies" as he believed the new lands to be. But Columbus was a lousy governor (i.e. CEO) and over the next six years, his methods became harsher and the complaints from the colonists louder until finally "Chairman of the Board" King Ferdinand appointed Francisco Bobadillo as governor to investigate the allegations of mismanagement. As a result, on October 1, 1500, Columbus was arrested and sent back to Spain in irons. He was eventually released and allowed to lead another expedition but he was permanently removed as governor. 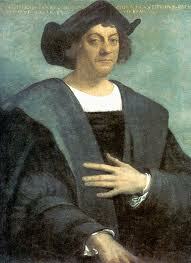 Columbus died on May 20, 1506 a wealthy man and firmly convinced that he had reached the east coast of India. So when did Spain and the rest of Europe figure out that what Columbus had discovered was a new continent? From 1499-1502, Amerigo Vespucci conducted his own voyages to the New World. A German cartographer, Martin Waldseemuller working from Vespucci's journal became convinced that the land that Columbus had reached was not India but an entirely new land. In a map he published in 1507, a year after Columbus's death, he labeled the new land America after Vespucci. Perhaps if Columbus had been able to recognize this, the two new continents would today be called North and South Columbia and America would be that Latin Columbian republic next to Venezuela in South Columbia. In the end, Columbus's legacy was recognized. Strangely, even though he thought big (there's nothing small about asking for 10% of the profits from the New World in perpetuity...), in the end his vision wasn't big enough. He never found a commercially lucrative western sea route to the Orient but something much bigger: the New World. * I'm not going to debate here whether Columbus was actually first or not. I'll leave that to professional historians. 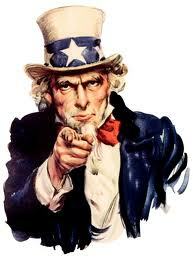 Independent Contractors, Uncle Sam Wants You! For many reasons, early stage startups love to hire contractors instead of employees. Independent contractors are often cheaper, the company doesn't have to pay employment taxes, benefits, or worker's compensation insurance, HR compliance issues are simpler, and the company retains workforce flexibility. Unfortunately, I have to remind my clients that the choice as to whether someone is an independent contractor or an employee is not necessarily up to them. "But we're only going to hire them a few hours a week!" Sorry, but full time vs. part time does not determine whether someone is a contractor. They might be a part-time employee. "But they want/have agreed to be an independent contractor!" Sorry but willingness on the part of both parties is not a determinant either. So who does determine whether someone is an independent contractor if not the two parties involved? The IRS and the state. So what determine whether a person is an independent contractor vs. an employee? Unfortunately, the answer is not clear cut. The guidelines used by the U.S. Dept. of Labor, IRS, and (in California) the Employment Development Department (EDD) is whether the employer has the "right to control" a person's work whether it is exercised or not. They also look at whether the contractor can suffer the risk of loss, provides their own tools, have their own workspace, are publicly available for business with multiple clients, and the duration of the work engagement. 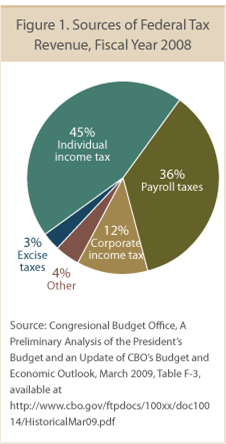 So how do government auditors determine this? Largely its a judgment call. With respect to the above factors, the more often the contractor answers "no" and if the engagement extends more than six months, the more likely the auditor is going to want to classify that person as an employee. The IRS used to have what it was called a twenty point test, but replaced this a few years back with the more ambiguous guidelines in effect today. Note that the penalties for misclassifying someone who should be an employee as an independent contractor can be significant including back employment taxes, associated interest, and penalties. "So how will anyone find out?" It usually happens when someone unfamiliar with the laws and working as an independent contractor gets terminated and files for unemployment benefits, listing the company as the last employer. But independent contractors are not eligible for unemployment benefits; they are supposed to be independent businesses. 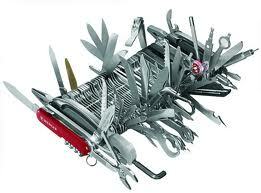 This can then trigger an audit. And in the current economy with many state governments running budget deficits and the widespread abuses in this area, state auditors are getting much more aggressive about going after small businesses, which are much more likely to be in violation. So what should a small business or startup do to protect themselves? Signed Independent Contractor Agreement - You should have a signed agreement drafted by an attorney. It should spell out that the contractor is responsible for filing and withholding their own taxes and have their own insurance (general liability, workman's comp if applicable). It should also have a statement of work that preferably outlines a work project with milestones, deliverables, and project fee vs. just calling out a rate and general duties. Determine what control is necessary over the way the work is performed - While you have the right to determine what the work product standards and deliverables should be, the more the contractor determines how, where, and when the work gets done, the more likely the contractor will be considered independent. If a job requires that the person follow your detailed policies and procedures, under your supervision, at your premises, using your equipment, you probably need to hire an employee. Review the IRS guidelines mentioned above - See how many of these factors your contractor can pass. The more the better. Check to see if the job falls into the "statutory" category - There are certain jobs that have been defined by law to be employees. Examples can include officers of corporations, full-time dedicated sales people and insurance agents, agent/drivers in food service, laundry, or dry cleaning, or home workers performing work on employer supplied materials. The list can differ from state to state. If in doubt, consult a human resources specialist or labor attorney for advice. The hour fee is worth it. Or if you don't want to do that, all you have to do is file a Form SS-8 with the IRS. They'll be happy to provide their objective, unbiased opinion.